Mitropa Cup 2012 takes place at Solaris Hotels Resort ?ibenik, Croatia, from 30th May to 8th June, 2012. Men’s selections of: Austria, Croatia, Czech Republic, France, Germany, Hungary, Italy, Slovakia, Slovenia and Switzerland. Women’s selections of: Austria, Croatia, Czech Republic, Germany, Hungary, Italy, Slovakia, Slovenia. 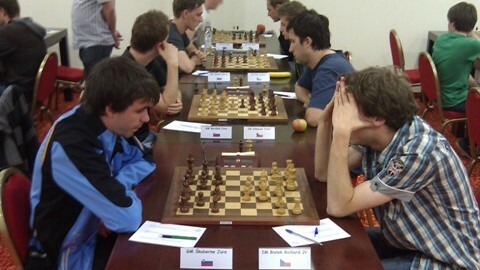 Mitropa Cup 2012 is played according to FIDE Laws of Chess and the Team Round Robin system of play, with 9 rounds for men’s and 7 rounds for women’s selections. Each federation is represented by a team of four players and one reserve for men’s section and two women players and one reserve for women’s section and one team captain. The overall team list consists of 5 players in men’s selection and 3 women players in women’s selection. The final ranking is determined according to the higher number of match points. Tie Break 1: match points (2 for wins, 1 for draws, 0 for losses). Tie Break 2: points (game points). Tie Break 3: the results of the teams in the same point group according to the number of match points. The first three teams of the final ranking will be awarded gold, silver and bronze medals. Last year winners were Germany (Men) and Italy (Women). Tournament director is IO Ervin Sindik. The Chief Arbiter of the tournament is IA Nenad Doric, his deputy is FA Robert Dabo-Peranic. The organizer is Croatian Chess Federation.